Back when computers (even Apple Macintoshes) were beige, everyone used big, plastic, clacky keyboards. These varied a lot in quality from horribly cheap and mushy, through pleasingly solid, to the legendary IBM Model M that could be used to knock holes in walls, and was incredibly loud. I don’t think that I thought a lot about keyboards in those days, partly because I hadn’t yet learned to touch-type. I did, however, always find that using an extended keyboard was a stretch for my stumpy Hobbit fingers, and I had to stretch my arm an uncomfortably long way to the right to operate the mouse. In due course, I taught myself to touch type just at the point when keyboards (even Apple ones) became rather spongy and poorly put together. The nadir for me was the transparent plastic-encased keyboard that came with the early flat-panel iMacs. It was tall, wide, the keys required quite a lot of effort to press and had a long travel, and the transparent case just served to display how much dust and sandwich detritus it had collected. I eventually bought a MacNTouch keyboard. This offered no tactile feedback at all, and was essentially just a gigantic multi-touch trackpad1. I loved it and really enjoyed typing on it after the giganto-keyboards I had used up until then. It was completely flat, and you could use it for mousing as well as keying, so you didn’t have to move your hand off to the side. I thought at the time that what I had disliked about the old keyboards was the height and the length of key travel, but I’m not sure that this was entirely correct, as we’ll find later. I managed quite well without tactile feedback, but you did have to be constantly vigilant about the position of your hands and fingers. The MacNTouch was a replacement for the keyboard on a 15” PowerBook laptop, and when I eventually got a new computer, I tried using the keyboard as an external unit. It worked, but it wasn’t quite the same. Apple then moved to low-profile aluminium keyboards, both on the laptops and as external keyboards with their desktop machines. These were good quality keyboards with flat, low-profile ‘chiclet’ keys, which had very low-travel and were separated by spaces. I loved these keyboards, particularly the compact Bluetooth versions with no numberpad, which meant that your mouse or trackpad wasn’t so far away. I still think that this is probably my favourite keyboard of the ones shipped with Macs. Again, I assumed that the low-profile format, small size and low key travel of the keyboard was what I liked about it. 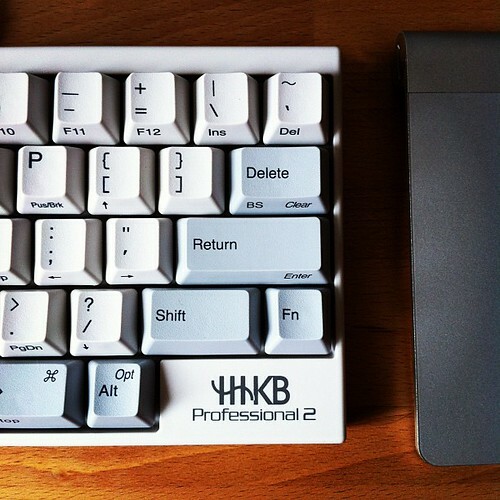 Then I started hearing a lot of discussion of mechanical keyboards, and specifically, the Happy Hacking Keyboard Professional 2 (HHKB). Most modern keyboards use rubber dome or scissor keyswitches. The former tend to have slightly ‘mushy’ feel, as the contact is closed when the rubber surface collapses as the key is pressed. These kinds of keys often have a bit of what might be termed ‘wobble’ (it’s the technical term, you know). When you hit the key off-center, it can tilt over to one side and fail to activate. Similarly, scissor keyswitches tend to be slightly wobbly, and offer little tactile feedback. Most mechanical keyboards have real mechanical switches underneath each key, and offer a much more solid response, with specific tactile feedback about whether or not the key has been activated, and which controls the way that the key returns to a resting position. As with any geeky topic, there are endless heated debates online about which of these switches (and hence keyboards) are ‘the best’, with some die-hards still preferring the loud, buckling-spring keyswitches of the IBM Model M I mentioned earlier. The HHKB uses Topré capacitive tactile keyswitches, which are not actually considered by many people to class as mechanical keyswitches, because they use rubber domes as well as a cone-shaped spring to provide the required force and tactile qualities. However, it is a world away from standard rubber dome keyboard in terms of quality, and the tactile feel is generally thought to be superb. I was intrigued by this, particularly when @BestofTimes and @HelgeG started comparing notes about their HHKBs. I had been having some discomfort in my hands using my Apple aluminium keyboard for a little while, particularly when using it for extended sessions. I type a lot, both at work and at home, so I spend a long time every day using a keyboard. Still, the HHKB is expensive, and I probably wouldn’t have got one had it not been for the fact that I won an award at work that actually came with some money, rather than just the usual handshake and pat on the back. Since I was now in possession of a bit of ‘mad money’, I decided to order the keyboard. It was a risk (would I like the taller key surface and longer key travel? ), but since the keyboards are popular and hard to get hold of in the UK, I thought I could probably sell it on eBay without losing much money if it turned out not to be to my taste. Now I reach the hard bit: what does the keyboard feel like? First, it’s a perfect size for me. Each of the keys is just the right size to accommodate my fingertips, and even with my Hobbit-proportioned hands, I can reach every key without stretching too much. The keycaps are gently scooped out (as keyboards always used to be before the advent of the chiclet), so your fingers naturally centre themselves on the keys in a way that feels very natural. I almost never hit a key on the edge as I used to do with other keyboards. Even if you do happen to strike a key off-centre, there is no wobble: the keys are made of a good quality, heavy plastic, and the switch mechanism means that they move in a reassuringly solid way. The combination of the rubber dome and the cone spring provides the perfect balance between firmness and ease of activating they keys. It requires enough force to activate that you can rest your hands on the keys without worrying about accidentally pressing one, something that I couldn’t do on my previous keyboard. When you do press, it’s very smooth and without bounce, but with enough grain (for want of a better word), that you can feel what you are doing. It’s a bit like handling a Lamy 2000 fountain pen or a smooth river pebble: it’s smooth, but your fingers know that you are touching something. It’s also a soft (but definitely not mushy) landing. When you type on a chiclet keyboard, the keys abruptly bottom out and you hit the hard metal case, which I think is partly what creates the fatigue and discomfort. The HHKB feels much more cushioned, but without in any way masking the feedback you get from activating the switch. I’m not a pianist, but I imagine that it’s the difference between playing a plastic synthesiser keyboard and a top-notch piano with beautifully weighted wooden keys. It just feels right. The other thing that mechanical keyboards are famous for is noise. Moving springs and switches means clicking. Loud clicking. The HHKB is certainly not in the same league as the deafening IBM Model M, or even the MX Cherry-equipped keyboards, but it’s certainly not almost silent like the Apple aluminium keyboard. It produces a kind of ‘clop’ more than a ‘click’, which I find a very pleasant sound. It’s not annoyingly ringing, but sounds reassuring. When I set off at a full typing gallop, it sounds a bit like heavy rain falling on the roof of a wooden hut: a very meditative sound and one that for me, now, is the Sound of Writing. Turning to more practical issues, I haven’t found (as I had feared before buying it) that I miss any of the missing keys. The arrow keys are accessed by using the function key (far bottom right of the keyboard) with the semi-colon, comma, left square bracket and forward slash keys. It’s certainly odd at first, but you do soon get used to it and reliably hit weird keys when you have to use another keyboard. I do still sometimes find myself getting into a bit of a motor pickle when using a sequence of keystrokes that involve the arrow keys with other keys. For example, if you are in a word processor that uses Option+left arrow to move back a word, then Option+Shift+right arrow to select that word, I have to think carefully about what I’m doing. However, most of the time I’m using Vim, and don’t have to worry about the arrow keys at all. I found initially that I was hitting backspace instead of return because of the unusual positioning of those keys, but again, it only took a paragraph or two to adapt, and now I find them both much easier to reach and hit. Best of all, the escape key is very easily reached, which makes Vim a joy. I had already set (in software) my Caps Lock key to activate Control on my old keyboard, so I didn’t have to make a new muscle memory for that, but it’s nice to have the key properly labelled. The length of key travel and the vertical height of the keyboard has been no problem at all. I think now that what I enjoyed about the Apple aluminium keyboard was the compact size and the fact that while the chiclet keys still wobbled, it was slightly less obvious (and therefore less annoying) because there was a shorter vertical distance over which they could display the wobble. You might think that getting this obsessive over a keyboard is madness. It’s certainly the very definition of a first world problem. However, in addition to a screen, the keyboard is your primary means of interacting with a computer, and it’s one that you touch for many hours a day. Pressing a key might feel only slightly uncomfortable, but those tiny bursts of discomfort are cumulative and can add up to a lot of annoyance over a whole day of keystrokes. In case the 1,700 or so words so far have not made it plain, I love this keyboard. I find excuses to write with it. I disconnect it and take it between work and home, just so that I’ll be able to use it in both places. I enjoy the feel of the keycaps on my fingertips as they sit poised while I think about what I want to type. In more prosaic terms, I tested my typing speed on this keyboard and my previous one, and I average about 10 words per minute more on the HHKB, with fewer errors, so it has also made me more efficient. I expect that I will get even faster on it over time. That increase in efficiency, and the fact that using the keyboard just feels good means that it will certainly have earned its price tag over the many years that I hope to continue using it.